"I much prefer a cathedral, this is far worse." Acoustic Directions' Glenn Leembruggen has been called into some hostile acoustic environments before but this may well be the most brutal. It's the Syria of sonic spaces; it's the St Helena road tunnel just north of Byron Bay in northern NSW. "There's not even any bitumen, the road is concrete." In an environment that's unremittingly hard and reflective, a layer of asphalt is blessed (absorptive) relief. 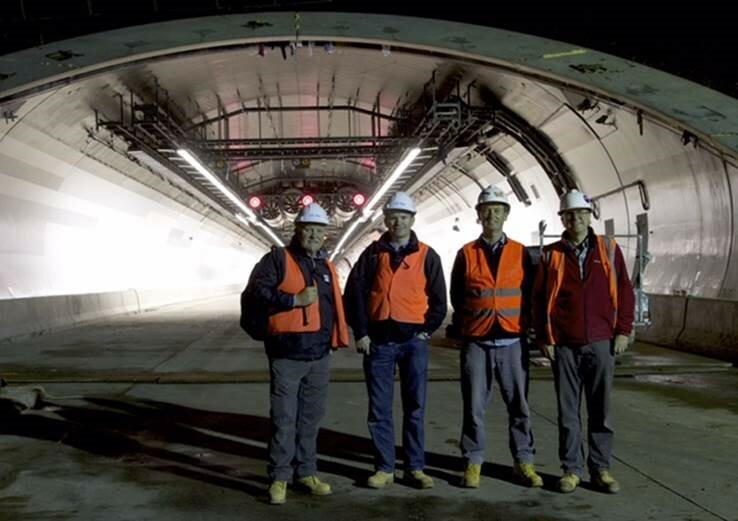 According to Leembruggen's measurements the 400m tunnel has a reverb time of around 8s at 250-500Hz, which falls gradually to 4s at 8kHz. Ouch. Suffice it to say, installing any kind of PA into this kind of environment (let alone an emergency announcement system that could potentially save lives) is difficult. Savage acoustics aside, road tunnels have a couple of other factors that adversely impact on the performance of a loudspeaker system. Traffic noise is the most obvious contributor. If you have an emergency situation where a collision is blocking traffic you need the public address system to be heard inside every vehicle's cabin over the ambient engine noise of hundreds of cars and trucks. The other X factor is the extraction fans. During an emergency where there may be a fire and smoke, huge jet fans kick in, sucking out as much of the smoke and fumes as it can. The fans are noisy. Traditionally, hundreds of daisy-chained 100V constant voltage speaker boxes would line a tunnel all set to the same time-zero. The STI from such a system would be miserably low. STI stands for Speech Intelligibility Index. A score of 1 is perfect and a score of 0 perfectly dreadful. A score of 0.5 is the sort of benchmark you'd find specified for an emergency message system in a tunnel. Scoring 0.5 with a conga line of 100V speakers is just not going to happen. Duran Audio gave this some thought and introduced the AXYS ABF-260 tunnel horn. The product is based on a 100W single compression driver with a two-inch voice coil, but the trick is in the horn. The ABF-260 is installed onto the ceiling of the tunnel, pointing down the length of the tunnel and between each lane of traffic. The official dimensions of the horn is 1391mm(L) x 892mm(W) x 345mm(H) but the ceiling of the tunnel actually serves as part of the waveguide. The bright idea means you decrease lateral (side-to-side) reflections quite considerably by using the ceiling as part of the baffle. The next part of Duran's cunning plan is to time delay each bank of speakers back to the opening of the tunnel. This approach results in a constant coherent wavefront down the length of the tunnel. Duran's constant voltage amps pack delay and EQ onboard and are the two main levers acousticians, Glenn Leembruggen and David Gilfillan, have to pull during the commissioning process. The distance between the of the speaker banks are measured (Duran Audio recommend around a 50m spacing) to assist in setting the optimum delay. From there they sweep the space to determine the best EQ curve that'll provide the best possible intelligibility outcome. The result is a big, acoustically ugly space that's brought to heel. It's not magically transformed into the concertgebouw, but the emergency messages are easily comprehended.